I am being a sarcastic, of course. Ukraine has banned broadcasting of Russian TV channels. Georgia cut access to the .ru domain and banned Russian TV channels (and Euronews! ), no doubt to silence any questioning voices over their criminal aggression as opposed to the likes of Fox, CNN or the BBC, which swallowed the psychopathic Saakashvili’s lies hook, line and sinker. Finally, and most disturbingly, Latvia is now arresting those who dare question the stability of its economy on charges of ‘destabilizing the financial system’. The Western MSM would do well to express greater interest in this instead of endlessly hectoring Russia – the whole specks of chaff and logs and eyes thing, you know. Otherwise, as in the 1930’s, the debris of capitalism could end up once again incubating incipient fascist regimes. MOSCOW, October 9 (Itar-Tass) — Russia is seriously concerned over a ban on broadcasting of Russian TV channels in several Ukrainian regions, spokesman for the Russian Foreign Ministry Andrei Nesterenko said on Thursday. Looks like they’ve decided to take Loco Lucas’s advice to heart (apparently, Russian media is a hotbed of Nazi propaganda), thus following in the footsteps of Georgia which banned Russian TV broadcasts and access to the .ru domain during their criminal aggression against Ossetia. False Dmitri gives us the breakdown on Latvian information control about the financial crisis. Put’s the Streetwise Professor’s (mostly unfounded) complaints of Russian ‘information management‘ into perspective. A few days ago the Latvian Finance Minister Atis Slakteris informed that several of those responsible for spreading rumors about devaluation of the Latvian currency had been arrested. Another disturbing news concerns an economist working at the Ventsipls University College who has been arrested for an article about the perspectives of the Latvian economy and the banking system of Latvia. All this confirms that Latvia is experiencing a very serious financial crisis. 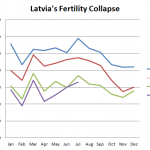 The days of the “Latvian economic miracle” (and democracy?) are over.